Argadells is a must for any 4WD enthusiast with its exciting network of tracks criss crossing the property, from the deep winding gorges to the heights of Mount Arden. Mount Arden is the highest point in this part of the Flinders Ranges and the magnificent views extend to Lake Torrens, Melrose, Horseshoe Range, and Wilpena Pound. The tracks are your path to exploring the beauty of the Flinders Ranges. 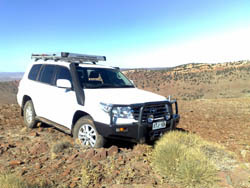 4WD tracks range in difficulty from straight forward to challenging. Please examine the map carefully before you head out for a drive and only follow tracks that are matched to your experience and your vehicles capabilities. Cost is $50.00 per vehicle. Bookings are essential and can be made by ringing Malcolm or Judy on 08 8648 6246.